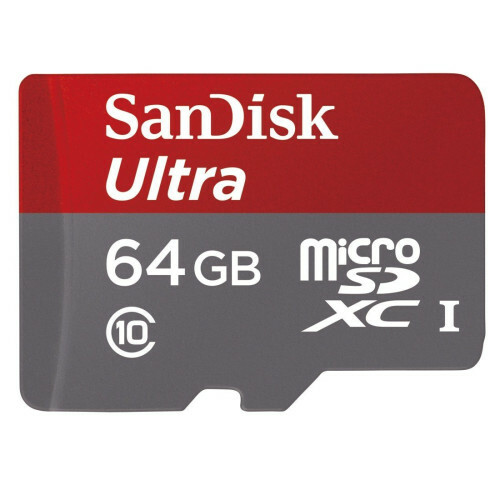 Large-Capacity Card Holds Thousands of Photos or Hours of Video With the SanDisk Ultra microSDXC UHS-I Card, you'll never have to choose what to keep and what to delete on your Android smartphone or tablet. With a generous capacity of 64 GB (1), this card lets you shoot and store more photos and videos without running out of space. You'll have enough room for thousands of high-resolution photos or hours of Full HD (2) video. 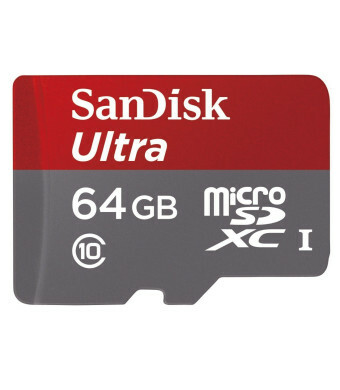 Capture, carry, and keep your videos, photos, and music at your fingertips with 64 GB of storage.View larger Shoot and store hours of Full HD video on your Android smartphone or tablet.View larger Capture Full HD Video on Your Android Smartphone or Tablet The SanDisk Ultra microSDXC UHS-I Card is Class 10, letting you capture smooth Full HD video without interruption. Designed to be extremely durable, the memory card is waterproof, temperature proof, X-ray proof, magnet proof, and shockproof (3). The SanDisk Ultra microSDXC UHS-I Card comes with a lifetime warranty (7). Twice as Fast as Ordinary microSD Cards SanDisk Ultra microSDXC UHS-I Cards are twice as fast as ordinary microSD cards (4). Read speeds of up to 48 MB/s (5) let you quickly transfer photos and videos from your smartphone to your tablet or computer. Back Up Your Favorite Media with Memory Zone App Available from the Google Play store, the SanDisk Memory Zone app (6) lets you view, access, and back up all your files from your phone's memory in one convenient location. You can even set the app to move files from your device's internal memory to your memory card automatically. An SD adapter is included to transfer files from your phone or tablet directly to your PC or Mac.